They’ve made the list, you’re checking it twice, you already know when they’ve been naughty (and when they’ve been nice). So much of the holidays revolves around shopping and presents, and for kids, so much of the season revolves around toys. Even if your children are too young to make their own list for Santa, you already know they’re going to get one metric ton of toys. Grandparents and aunts and uncles are going to bring all the presents, most of which will likely start collecting dust before New Year’s. If you’re feeling overwhelmed about the amount of stuff, if you don’t want money spent on toys that you know your child will quickly forget about, you’re not alone. At Growing Kids Learning Centers, we think you can go without all that “stuff” and still have an amazing experience with the ones you love. If you’re looking for a gift idea list that doesn’t involve the toy aisle at Target in December, we’ve got you covered. Find holiday gift ideas that aren’t toys, and enroll your young one at one of our child care centers! With locations in Goshen, Bristol, South Bend (at Ireland Road, State Road 23, and North Bendix Drive), Elkhart, Valparaiso, and Chesterton, you never have to go far to give your kids the best in child care. Building the home library is one of the most admirable and worthwhile gifts you can give. Reading aloud to your child is one of the single most important things you can do as a parent — it makes an incredible impact on their academic and overall growth and development. Invest in some classics — your child might love reading the books that you loved as a kid! — and try out some new titles as well. “The Book With No Pictures” by B.J. Novak is a fun read, despite being exactly what you think. Some other new titles in 2018 include “The Digger and the Flower,” “Elmore,” and “Wordy Birdy” (the last one is especially great if you have a chatty child). By finding books that teach valuable lessons and are fun to read, this is a gift that will truly keep on giving! Kids love working with colors and creating something new. Arts and crafts are a perfect present for every child to try! Finger paints, colored pencils, crayons and a new coloring book, jewelry making kits — the list goes on and on. Arts and crafts are a great way for your child to explore their creativity and imagination, and they might just find a new hobby in the process. Has your child just started getting into sports? Are they ready and rearing for their first soccer team that starts this spring? The holidays are a great gift-giving opportunity that can help them get their feet wet. 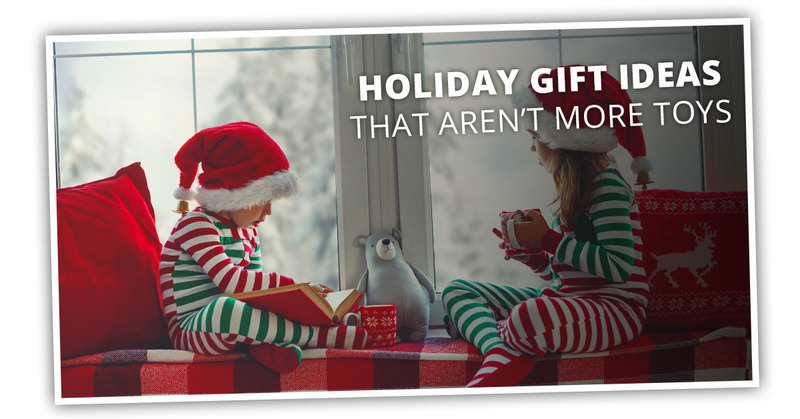 Nerf balls, footballs, baseballs, frisbees, scooters, or bikes are all some other sports-themed gifts that your child will surely continue to love and use (especially when it gets warmer out). Kids usually have just a few toys that they truly love and that they remember. Experiences, however, are a gift that sticks with them, and helps shape who they are. The best thing about giving experiences as a gift is that it provides more opportunity for you to interact and connect with your young one. Plus, it doesn’t really matter what the experience is — if you hype it up, your child will be just as excited. Mini golfing, trips to the museum, driving out of town to explore a new park or hiking trail, or even a trip to a hotel (with a pool, of course) are all things that kids will simply love. You can make it so that they still have something to unwrap by giving them a card with some picture clues, or create a scavenger hunt to help them figure out where they’re going! Kids are what make the holidays so much fun. You want your child to have an incredible time, but you also want it to be worthwhile and meaningful. With these non-toy-related gifts, that can most certainly happen. Stay tuned for a few more ideas in our next blog, and contact Growing Kids Learning Centers to get the best in child care and preschool!